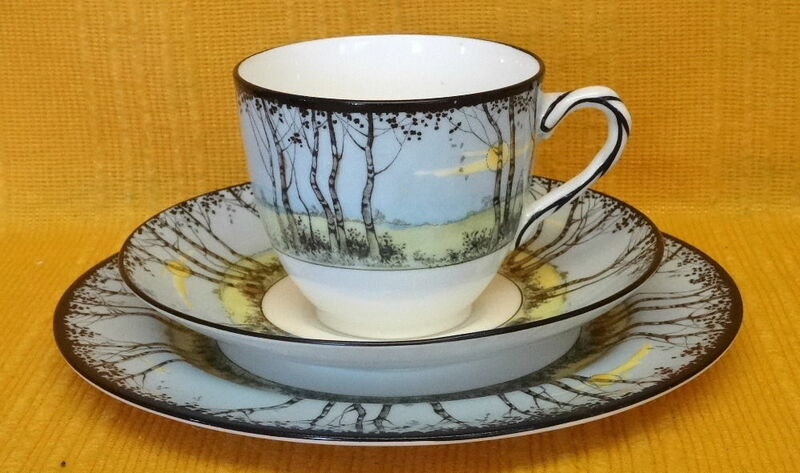 A fine bone china cup, saucer and plate trio by Royal Doulton in an Art Deco pattern of the sun in a blue sky, shining through trees #H2588. Fully marked, including date code for 1926. In very good display condition, but the top surface of the saucer is crazed, as is the bottom of the cup. Also, the cup handle has been broken and reaffixed. We both love this so much- I’ve not seen another piece in it so I was glad to get it for as little as we did.